I talk to a lot of people who think that they are ready to start promoting their business more in order to take it to the next level– in fact they know they need to do it and are ready to do it, to a certain extent. But then they start to question themselves. They think, how can I promote my business when there are 10 other people with such similar businesses who are maybe even doing it ‘better’ than me. What can you do to get around that? For effective promotion you have to truly stand behind your brand and have confidence in what you’re promoting. You need to get past this mindset in order to truly push your brand, or people will be able to sense your hesitation. But how do you do that? Here’s how. Remember you have your own unique story and personality. Sell that. Nobody else can have the same business as you. Nobody else can be offering the exact same thing. They just can’t. You offer your products or services but you also offer your personality and the experience of doing business with you. And that’s what separates you from the crowd. So own the ‘you’ that’s in there as part of your brand. Don’t be afraid to play up your personality when it comes to promoting your business. Don’t know what I mean? Think about all the brands you follow and how similar some of them are to other businesses you see all the time. Yet, for some reason or another, you feel more attracted to certain ones. There are ones that you actually search for on social media to see updated posts, that you actually know you’ll read all the way through their emails when they come into your inbox, that you feel like you know the person behind the brand and that she speaks to you. Why is that? It’s because you resonate with her unique personality and you just click with her more than anyone else offering the same services— just like you sometimes click more with one person than another when you meet in a social setting. You have this unique ability in your business, too. Try to keep this in mind while you develop your promotion strategy so that you don’t run into self-doubt. You will find that reminding yourself that your business is uniquely you and that nobody has your same story will serve as a reason that you stand out from the crowd. It makes you the one that someone will connect with, and that alone is why you owe it to her to promote yourself in such a way that she will find you. Any time you start to question if you have anything worth promoting or start to think you should put it off a little longer until you have something worth telling people about or something more interesting or exciting or unique, remember that your business already is different than anyone else’s in the world, and that is enough to go on when it comes to promoting it. So how can you actually use your story and personality in your brand and promotion? Let people get to know you through your promotion. Pitch a publication an article that’s more focused on you as a business owner than solely your brand or product itself, let your voice come through in your materials by writing the same way you talk, let your personal story come through in bits here and there as far as your background and why you started your business in the first place. You’ll find that the more you promote yourself, the more these things will just naturally come through anyway, so you won’t even have to think about it as much as it seems. Most importantly just remember that you are uniquely you and nobody else has your story. You owe this to all the people you could be serving. Promote your brand to the world so they can find out about and take part in everything you have to offer. Ready to get some guidance on where to start with marketing your business with confidence? Join my free 5 day email challenge all about marketing yourself through PR. If you’re hoping to build your business and take it to the next level in the new year, there’s one thing you have to do. You have to promote it! You don’t need a big PR budget or to know everything there is to know about marketing and promotion, but there are a few things you can do easily and on your own, to get your business ready for extra visibility and to start promoting it. One of the most important things is to make sure that once people start hearing about you and finding out about your business you have your best foot forward and make the right first impression. 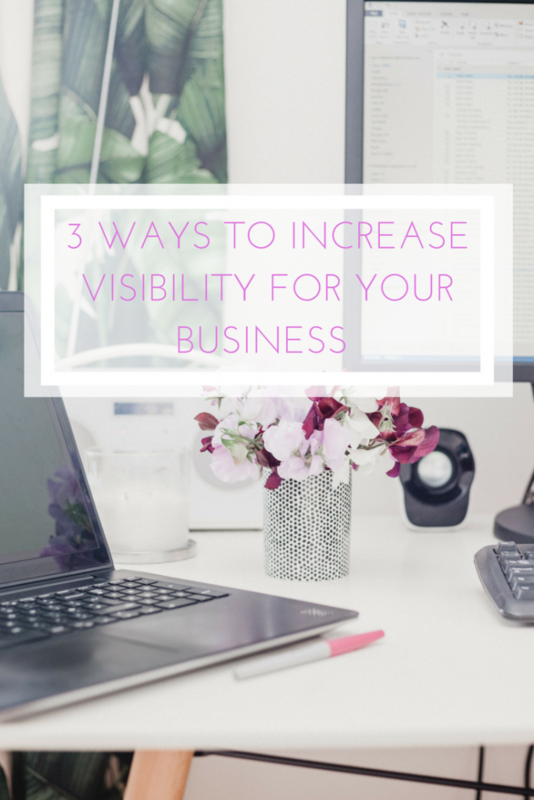 Here are some of the things you can do to set your business up for success when it comes to promotion and increasing your visibility to get bigger and better clients and customers. The most important thing to double check before promoting your business is your messaging. You want to be sure that your messaging is all extremely clear and gets across exactly what you want it to. People aren’t going to take the time to decipher what you mean if it’s not clear, and they will take you at face value after one glance—if they can’t tell what you mean and it doesn’t totally resonate with them, they aren’t going to buy into what you’re selling. This goes hand in hand with your messaging. Your branding must be consistent across all channels because just like the messaging, if it doesn’t resonate and make sense to the audience at first glance, it isn’t going to keep their attention. The look and feel of the brand should be the same from your website to your business card to your Facebook page. 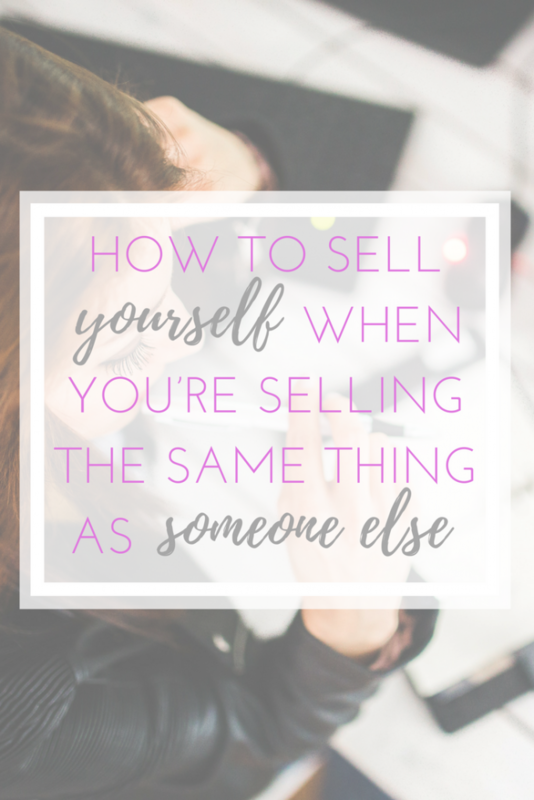 If someone sees something about your business in one place and then seeks you out or follows a link somewhere else, it should be entirely obvious that it’s the same company. This ensures you look professional and present a cohesive image. Once you’re sure your business is going to come across in the best possible light and portray the personality you want, you can think about something to pitch to the media to get some earned media attention. This will get eyes on your business that you never would have reached otherwise. It lends clout to your brand because people know that you’re in an article because a writer found you worthy, not because you created some content yourself or paid for an advertisement. Think of a few story ideas that would show off angles of your business that you want to draw attention to and then pitch them to writers at an applicable publication for each story. Don’t be shy to share everything about your business, especially once you start to get some media or other outside attention. It’s not weird to share the amazing things you’re doing or the attention that others have paid to your business. What you’re doing with your business is something to be proud of and everyone who follows your business will want to see it. Once you’re in an article post the links on all your social media channels and website and use the material wherever else you can for weeks to come, including in an email out to your email list, in a blog post, sharing the links to Facebook groups you’re in, and making images that share a specific quote from the article across your social media channels again- the possibilities are almost endless, and you should use it all as much as you can. If you’re ready to start getting more attention to your business that will bring in more clients or customers, and ultimately more money, you just need to promote the right things in the right ways. Then, the right people will fall in love with your brand and want to be a part of it. If you need help with any of the above, or just to talk through your visibility or promotion strategy for 2018 let me know! You have immense knowledge and skill that you know you can use to help one-on-one clients meet their goals and needs. If only you could reach these potential clients and let them know all that you have to offer and how great it would be to work together! One of the hardest things for people just starting out in their service based business is securing the first few clients. After all, once you have some it’s much easier to get others because you can show off testimonials and examples of results, and even have the current client spread news about your business through word of mouth. But getting those first clients? That can be tough. If you feel like you have set up your website, have your branding on point, know your offerings front and back, and are even promoting them through social media, but it’s all falling on deaf ears, here are some ways you can actually go out and get your first clients in a more proactive way. This may sound obvious, but you’d be surprised how many people just don’t ever go out and ask people that they know if they need or could use their services. It can be scary to put yourself out there like that, and people often feel weird about ‘selling themselves’ to family and friends, but that is just something you need to get over right now. People who already know and trust you are the best people to go to first. Even if they themselves don’t have need for your service, just let them know that you are currently actively looking for new clients and ask if they would be able to recommend you to one person they know who might actually need your service. Ask them to think of a specific person at the time of the conversation. You don’t need to put them on the spot and ask them to actually call them up right then while you’re in front of them, but having them think of specific people while you’re having the conversation makes them more likely to actually bring it up with the person the next time they see them. Just asking them to recommend you to people they know in general may not have the same results because they may forget or never put in the two minutes to think about who they know that would be a good client for you. I know a lot of people will tell you never to give your services or time away for free but I have to disagree. If you do not yet have any experience working with clients, just being able to say that you are working with a legitimate organization can be enough to get you a paying client. What’s more, you can build up a portfolio of work that you complete for them and show off the real world results that you achieve. Being a non-profit or neighborhood group, it also is reasonable to have offered your services for free (not that you’ll go around telling people this) because people often volunteer for these groups because they have a passion for the work they are doing and want to be a part of it. The key is to be professional, and treat it like a real client. Build relationships with everyone there that you can, because many of them have other businesses or projects they are involved with that they may need your services for in the future. Chances are you already have an idea in your head of a couple people or businesses in your niche that you would love to work with. If you don’t, a quick google or social media search should show you people in your area or, if you have a business model that allows you to work remotely, people who you would like to work with in general. Put together information about you and your company and show them exactly what you could offer them specifically, and how it would help them personally. Show them exactly what they would get out of it. Since you’re approaching them, this may not be something they think they need and they’ll be hesitant to spend money to pay you for it unless you can show them proven benefits. 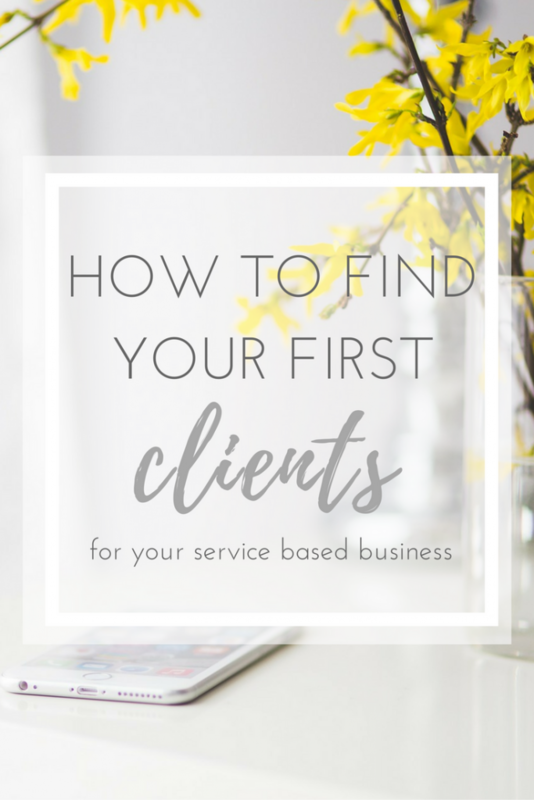 Do one or all of these, and you should be able to get your first client. You may need to do them over and over again, but every time you try one of these tactics, you will probably get a new client, or at least get one step closer. Remember, it may not happen immediately, but you’re laying the groundwork and putting measures in place to obtain clients in the near future. Don’t forget, the most important thing is to approach any of these tactics with professionalism, and put your absolute best foot forward once you do secure the client. And also stay completely professional even if they turn you down- they may still know someone else who could use your services, or their situation may change in the future where they realize they do need you. You want to make sure you still have the contact and that they remember you as a great person to work with. Make a goal for yourself to try at least one of these tactics this week and see if you can get a lead on a new client! Want to snag some PR opportunities but not sure how to even come up with them? There are tons of opportunities to take advantage of this spring/summer, that aren’t even related to a specific media outlet or area. 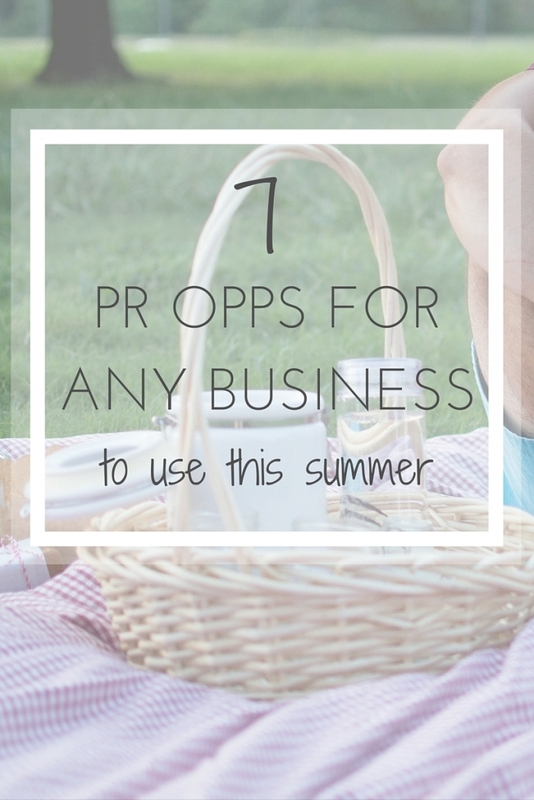 Here are some general summer PR ideas that virtually anyone can use for their business in the coming months. There will be others depending on your product or industry. For example, May 25 is National Wine Day, and if you own a wine brand, a restaurant or any food-related brand, a business where you sell glasses or mugs, or virtually anything related to eating or drinking, or even motherhood (haven’t you seen all the [sometimes troubling] wine/motherhood connection memes and products?) there is a chance to use that day as an opportunity for PR. The key is to find or make the connection between your business and the specific opportunity. You may think your business has nothing to do with graduation season but I bet there are at least three possible story angles you can find there. Maybe you sell a product that makes a great gift or home decoration? College grads are often given gifts, and chances are they are moving out of their college housing into a new apartment and could use a decorative item. Even for elementary school graduations– people often give teachers a thank you gift, or friends or family may give the mother of the grad a gift as well. For an idea that’s a little less obvious, if you don’t have a physical product or your product is not something appropriate as a gift, how about doing something for a group of graduates in your area? Throw them a little congrats event, or find a recent grad who you could mentor for the summer, or set up a way to give back to the school itself. All of these things are related to graduation season and would be completely applicable to pitch to local media letting them know what you’re doing. Chances are high that they would be interested in a human interest story like that since it’s so timely around a common theme that is prevalent in the community and affects so many people at that time. You can do the same thing for Father’s Day. Your product may not be geared toward fathers, or men at all. But there are ways to make a connection. Maybe someone who works for your business is a new dad, or there is a sweet story about your relationship with your own father that you think of during this time of year, or you want to find a way to help your customers celebrate dads. All of these are things that you can craft a story around. Pitch the local media about the idea, with all the pertinent details, based on the idea of a local business doing a tribute to dad, and you may be able to get a story. I think you get the idea of how you can apply the same exact thought process to any of the above ideas, plus way more. Now go through the list and try to come up with at least 2 or 3 angles you could use for your business with each opportunity. Determine which ones you like best (you don’t need to end up trying for each opportunity, 7 pitches would be a lot for a small business, especially when you’re just getting started with PR!) and commit to actually pitching at least 2 or 3 of them this summer! *pst– you just essentially started putting together a PR plan by the way! * Remember, your first couple of pitches may not get picked up, and it does often take multiple pitches to get one story placement, so don’t get discouraged. But at least you’ll be well on your way to getting some PR coverage, and you’ll know you didn’t miss any possible opportunities this summer. I’m so thrilled to share with you another blog post that I wrote for Mums With Hustle, a community of and for mompreneurs, that shares tips and stories from inspiring businesswomen who juggle it all. Click here to check the post out over there and spend some time checking out the other super helpful posts on their site, as well as listening to the podcast! Have a small business but not sure how to ‘get yourself out there’ beyond your circle of friends and family, or your social media sphere? It might be time to spread your wings and approach the local media. After all, publications are spotlighting and including information on businesses doing great things just like yours all the time. Why couldn’t yours be one of them? 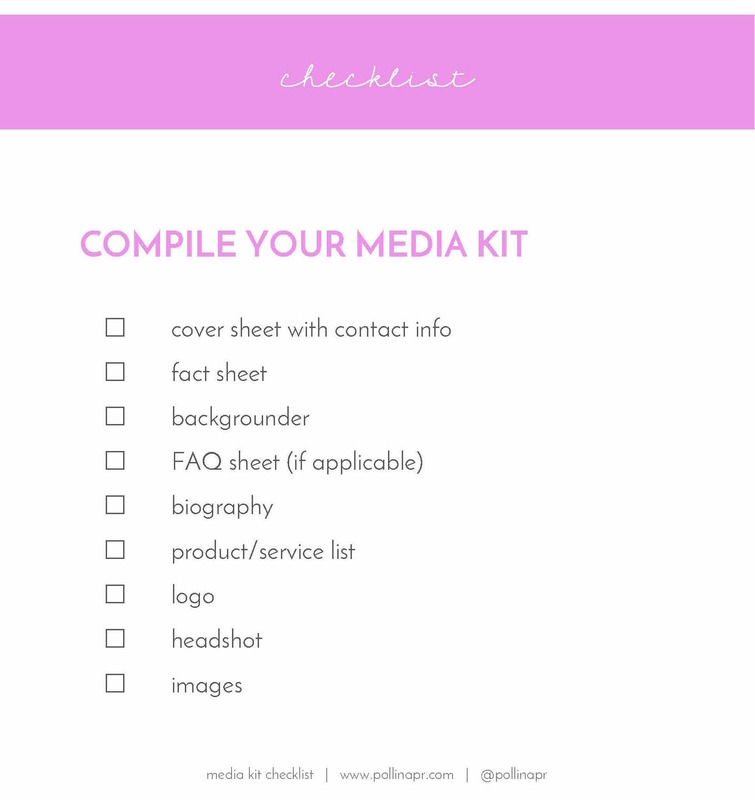 The one thing you need in order to get started with PR outreach and get to promoting yourself is a media kit. The good news is, it’s actually pretty simple to put a media kit together and something you can do today! 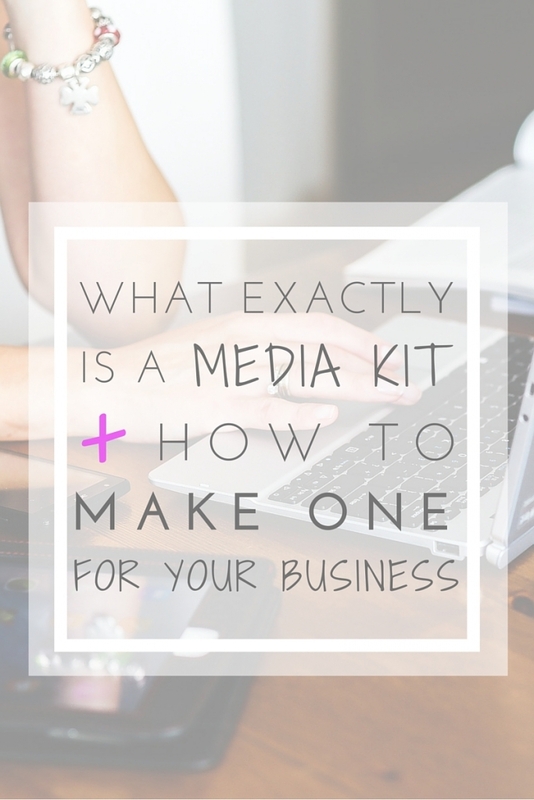 A media kit is just a compilation of information about a business all packaged together in one easy document. It is used in a pitch to media in order to provide them with everything they might need for including the business in their publication. It’s essentially all the background information on your business that shows and tells exactly what your business is all about. The idea is to provide media with all the details they would need so that along with a targeted pitch about a specific story topic, they would be able to put together a whole article about the business without having to contact you for any further information. Think of your media kit as you doing all the research for them. It helps them fill in all the details of whatever story they choose to write about your business. The easier you make it for a writer, the more likely it is that they will write about you. A media kit will include slightly different information depending on the business it represents. The main components usually include a fact sheet, which simply lists basic facts about the company; a backgrounder, which explains the history and mission of the business; short biographies of the owner or key players; and information on the main offerings the business provides, for example, a price list of the main products for a store, menus for a restaurant, or description of services for a services-based business. Depending on the business, sometimes an FAQ sheet is included as well, if there are a couple of main questions or bits of additional information about how the business works that often come up and require more detail than you can include in the other documents. The other important component is the visuals. A high quality logo should always be included, as well as a headshot of the owner or key players (whoever you include bios of), key products, and potentially the interior and exterior of the location if the business is a brick and mortar storefront. Once you have all the information together, create a cover page with the name of your business, logo, and all your contact information (including social media handles and web address) so that at first glance the reader will be able to see exactly what this whole thing is all about and will quickly be able to get in touch later if they need to. Then, make sure the whole thing is entirely cohesive by checking that the formatting, fonts and text sizes of all the different documents and pages are the same, put page numbers on the bottom of each page, and you can put a small logo on the top of each page or whatever other visual details match your branding. Lastly, save it all as one PDF document, or alternatively, save each piece as a separate document within one main folder uploaded to DropBox so that it will be easily shareable online via a personal link. Even if you don’t feel the need to start proactively contacting media, it is a good idea to have a media kit on hand just in case you need the information sometime. Media kits can also be useful if you’re thinking of approaching another business about cross-promoting with you and want to quickly and easily let them know what your business is all about, or if you are looking to bring investors on board and need to educate them about your business (and show how professional and put together it is)! Another way to use a media kit if yours is a product based business, is to just send out samples to writers accompanied by the media kit (with no specific story pitch in mind) just for them to become familiar with your product. The fact of the matter is that a media kit should basically be information you already have, it’s just a matter of compiling it all together, and making it cohesive and look nice together. And if you didn’t already have a written mission statement or company background or any other piece of this information already, then it’s something you really should have anyway so making a media kit is a great opportunity to get everything in order. There is another type of media kit used by bloggers, which is quite different from what is described above because of the differing uses and needs that bloggers have for them. An explanation and outline of a blog media kit will be included in a future post. It’s common knowledge that PR is helpful in growing your business and an important part of ‘getting yourself out there’. People know publicity is always good to have. 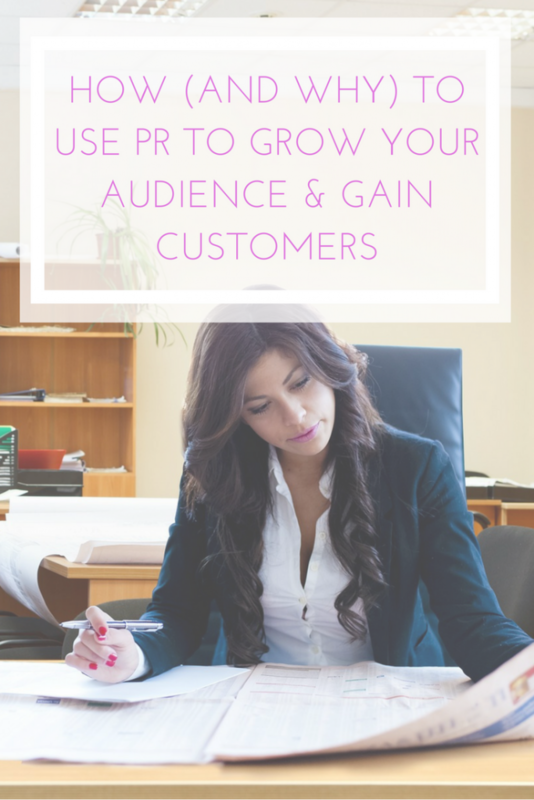 But a lot of the time, it seems like the average small business owner is a little stumped as to what exactly PR can really do for their business, in terms of actual specific benefits. It’s important to understand some of the benefits of PR so that you can determine the best ways to spend your time and resources in order to achieve what you want. Below are some of my favorite benefits of PR, in no particular order. 1 Spread your message, the way you want | Probably the most common reason people want PR for their business is because it is the number one way to let the wider world know what you’re doing and why. The ultimate bottom line is you want to get more customers, and one way to do that is to reach as many potential customers as possible, by getting attention for what you’re doing. Additionally, through PR you are able to reach the people you want, with the message you want, in a way that resonates with them. This is contrasted with, say, advertising, which allows you to spread exactly the message you want, but it comes with a (usually) steep price, and it’s always obvious that you paid for it– with PR the stories you get are always earned, so the audience knows you’re actually being endorsed by the media outlet and therefore consider it more reputable. 2 Position yourself as an expert | Let’s face it- if you own a business you are an expert in your field. It may not always feel like it, but think about it: you’re living and breathing your field every day. You’re being paid to do it (and hopefully making a living off of it)! Some days you may feel like you’re making it all up as you go along, but when it comes down to it, you know so much more about your field than anyone who is not running a business like yours. See? You are an expert! Once people start seeing your name in the media, and see articles about your field where you are the person providing quotes and insight, they start to see you as an expert. This gives you more credibility and positions you for further success. 3 Build a relationship with your audience | They don’t call it public relations for no reason. The whole point is to create relationships with the publics, ie your audiences. By reaching the relevant audiences where they are, and consistency providing information that they will find important and interesting, you are building a relationship with them- even if they will never meet you in person. It’s no secret that people are more likely to trust, buy from, and do business with the businesses that they feel they know and like. 4 Shape the story | This goes beyond your brand story. We’re talking about the big picture here. One of the smartest uses of PR is to shape ‘the story’ in a larger sense. It allows you to determine and define what is important in your field and what people should care to know about. You can use PR to draw certain things to the forefront of the news for your industry (and these would be the things that your company is specifically excelling at, of course!). By pitching certain topics to the media, or by taking control of the conversation while talking to media about a specific story, you can help determine what the media will cover to a certain extent. This means you can make sure that your audience are learning about the most important aspects of your business or industry or issue, which is so important. 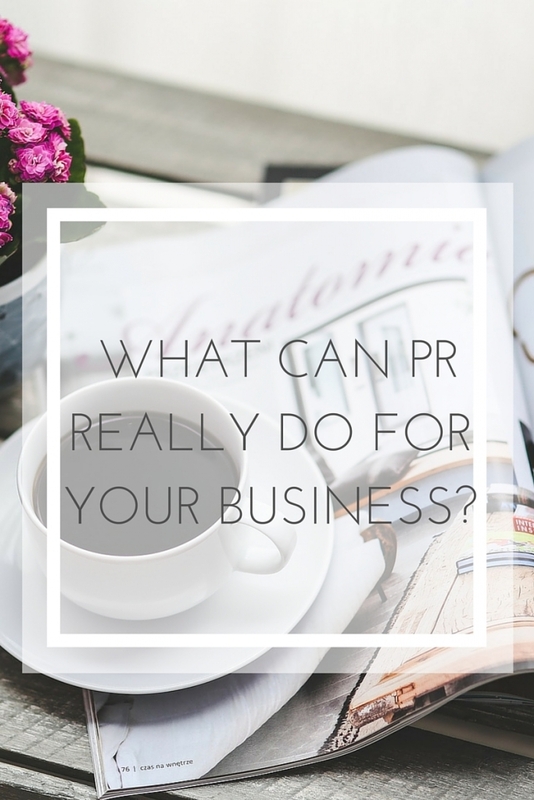 There are so many benefits of PR, and they all work together so much. Most important to keep in mind, is that none of these things happen overnight. But with consistent PR for your business, you can achieve all of them, plus more. And it will set you and your business up for ongoing success. I’m so thrilled to share with you a blog post that I wrote for Mums With Hustle, a community of and for mompreneurs, that shares tips and stories from inspiring businesswomen who juggle it all. Click here to check the post out over there and spend some time checking out the other super helpful posts on their site, as well as listening to the podcast! Promoting your small business can feel daunting when you don’t feel like you have any extra time or money to spare, or you simply don’t have any ideas of where to start. But here’s the good news: it doesn’t have to be expensive or hard. It could even be fun, and easy enough that you can get started today! You know that promoting your business is important. There’s no point in running a business if nobody knows about it or you don’t have any customers. All it takes is just making a push to get started, and then following through. You can promote your business and you can get started easily, right now. 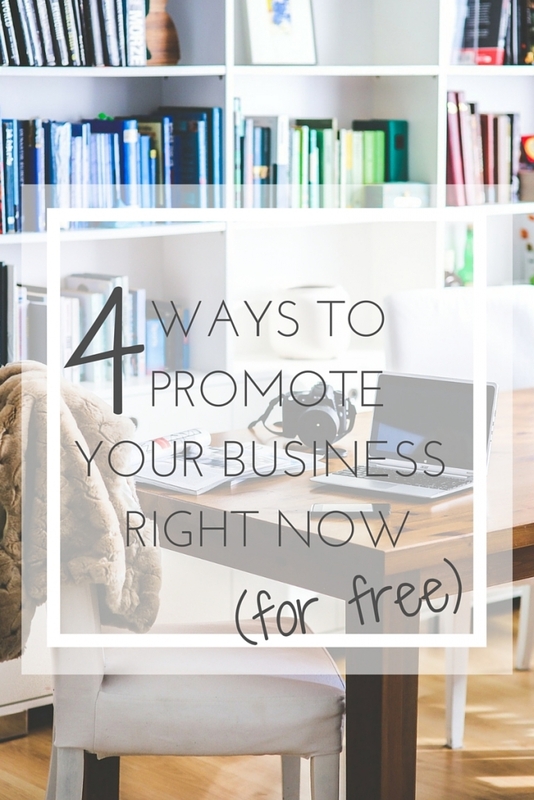 I’m sharing four easy promotion ideas that won’t cost you anything, and all you have to do is customize them to fit your product or service and brand. #1 Cross promote | Arguably my favorite promotion strategy, cross promotion is when you team up with a like-minded brand that offers a different product or service from yours but has the same customer base. You can organize something like a real live event, or just talk about each other on your social media channels- it can be as big or as simple as you want, but the idea is that you each share info about the other so that your audience becomes aware of the other brand, and their audience becomes aware of yours (and then theoretically choose to follow you and become a customer). Reach out to a business that you admire and invite them to cross-promote with you. That’s all it takes. #2 Hold an event | A great way to build buzz and gain new brand followers, an event is an overall fun way to promote your business. For example, figure out if there is a holiday or celebration of some kind taking place in your community, and then build an event around it (for example, host a Valentine’s themed ‘speed dating’ event where people can come get matched with one of your products to try out for a few minutes before deciding if they want to bring it home or move on to try another). You can literally come up with an event based around anything! Promote the event through your social media channels and any local media that you can. An event is a great reason to reach out to press. During the event you also get tons of great photos for use on social media and future promotion, as well as tons of people talking about you and your brand leading up to, during, and after the event. #3 Send some samples | This is potentially one of the easiest things to do if you have a product based business. Make a list of some of the editors of local (or not local, depending on your business) magazines, newspapers, and blogs/websites that are applicable to your business, and send them a sample! Include some information about your business and put it all in pretty packaging. Don’t expect that this will necessarily result in written coverage of your business, but just getting it in front of these influential people will benefit you in the long run. And when they have a story that your product fits into, they will remember it. #4 Blogger outreach | Similar to #3, this one is just what is sounds like. Research bloggers in your niche, and reach out to them. Bloggers may be more likely to write about your product because, a) they often post every day and are always looking for quality content, b) they have such flexibility to write about whatever they truly like, because it doesn’t have to be approved by editors and publishers, so as long as they see value in it they’ll want to share it with their followers and they will, and c) they can post almost instantly, theoretically, so while they probably have an editorial calendar with planned posts, if something comes up they can get a post up in a matter of hours. If you think you’ve already missed a window of opportunity to get into relevant print media, it’s often not too late for blogs. You will usually have to send a sample to them as well, but can also try reaching out with just your information via email or even social media, see what they think about your business, and only send them a sample if they are interested in it. Hopefully these ideas got your wheels turning and you thought of some ways to apply these to your business just from reading through this. Now take some time to really think about it and do a written brainstorm for some more specific ways you can implement some of these. 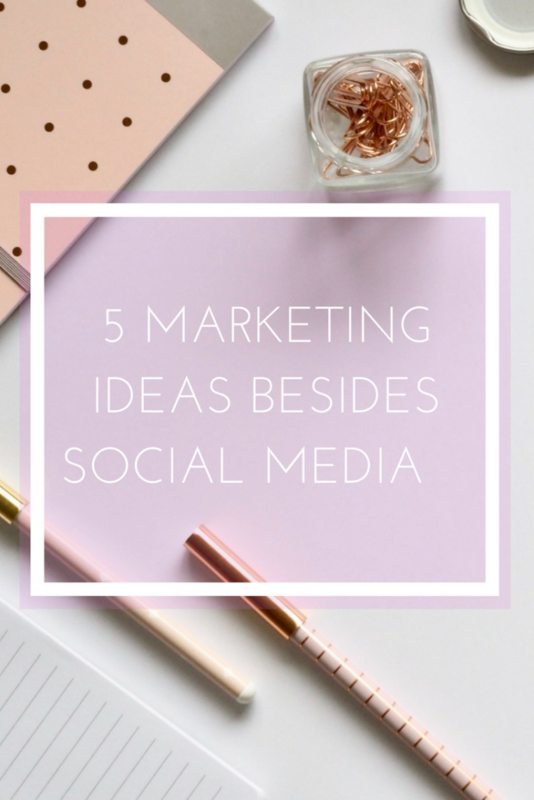 The beauty of these is that you could literally just practice these same four ideas (or even only two of them) over and over throughout the year and be successfully promoting your business. At most, these will cost you the price of a few samples of your product, (unless you go crazy with the event, which you absolutely could but don’t have to!) and otherwise they’re completely free. No excuses not to start promoting your business immediately and bringing in brand new customers, right? 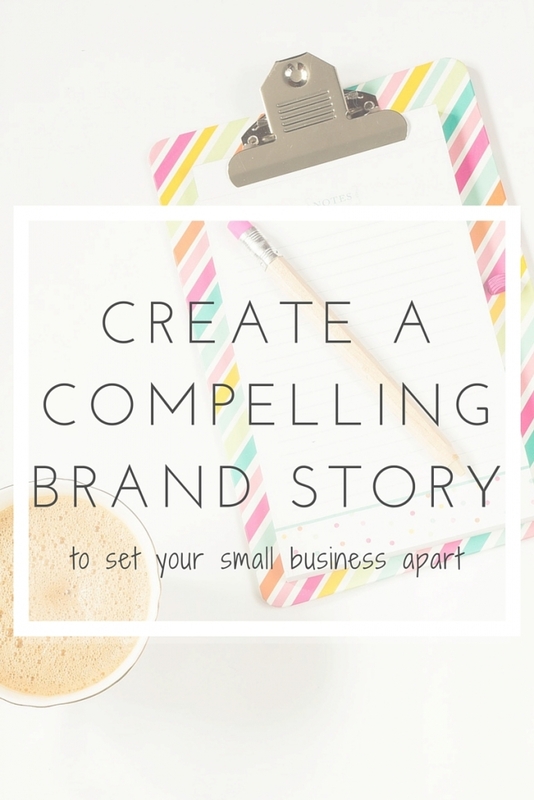 Telling your brand’s story is one of the most important parts of your brand communication. The individual story is what sets one brand apart from another. Each brand has one, whether you start out with it in mind, or have to think about it before even realizing what it is. To figure out what your brand story is, you really just need to be able to answer the questions ‘who are we?’ and ‘what are we doing and why?’ Your brand story plays a big part and can greatly impact the future of the brand, so it is worth articulating well. Your brand’s story can be the difference between getting new customers or clients and having them choose someone else entirely. The story gives people a chance to connect to the brand and give them a reason to care about it. This creates lasting relationships and loyal customers. Your story doesn’t have to be long and complicated. In fact, simple is often better. It also doesn’t have to actually include all the details of how the brand came to be or everything that the business does. It just has to include a couple key facts that will make your target audience connect with you and your brand. It should be tailored to your audience and what you want to accomplish. A brand creating a girly product that is run by a mother-daughter team should play up that fact and use it to their advantage. A food brand that creates healthy, delicious food from their own 100-year-old farm has a wonderful story right there. A technology company that helps expand communication around the world and connects people to family and friends has a great story to tell as well. 1 Be truthful | Nothing is worse than stretching the truth to create your story. People can tell when you’re insincere. 2 Be consistent | Have a longer version and a short version, and versions optimized for different outlets, but be very consistent in the details and voice in which it is told. 3 Communicate it as often as possible | There are more ways to get your story out there than you may initially realize. Use any and all opportunities to help tell your story, whether it’s through social media, mentioned in articles, or slipped into conversation. A brand’s story is one of the things that makes it unique and separate from all the other similar brands out there. Craft your story and then build it into your communications plan so you can use it consistently in your outreach. It will help set your brand apart.